Ask tristinstyling: How Do I Layer Jewelry? Lately, I’ve noticed the trend of layering jewelry to create a nice mix of metals, tones, and textures. Sometimes it looks really good and sometimes it just looks bad. How do I accomplish a tastefully done layered jewelry look? Is there a way to accomplish this on a budget or do you suggest investing in higher quality jewelry to get that polished, but stylish and updated look? Layering jewelry is definitely a way to spruce up any outfit since clothing isn’t the only thing in your wardrobe that becomes more interesting and fun when you layer. Jewelry looks even more fabulous when you layer it right! In fact, one easy way to figure out which pieces might work well together is to just pay attention to how jewelry is layered in the photos that accompany product shots when you shop online or browse catalogs and magazines. 1. Harlow Bangle, $32. Mixed Metals. 2. Copper Cupchain, $39. Available in Rosegold. 3. Rhea Bangles $79. Available in Rose Gold. 4. Clover single wrap , $39. available in Silver. 5. Bardot Spiral Bangle $49. Available in Silver or Gold. 6. Renegade Cluster Bracelet, $59. Available in Gold. 7. Pyramid Double Wrap Bracelet, $59. Available in Green or Cognac Brown. 8. Revival Bracelet $34. Available in White. 9. Tribute Bracelet, $36. (proceeds go to Breast Cancer), RoseGold/Silver Combo. 10. Vintage Twist, $39. Available in Silver, or Mixed Gold/Silver. 11. 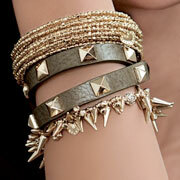 Studded Trifecta Wrap $59. Available in Black. 1. 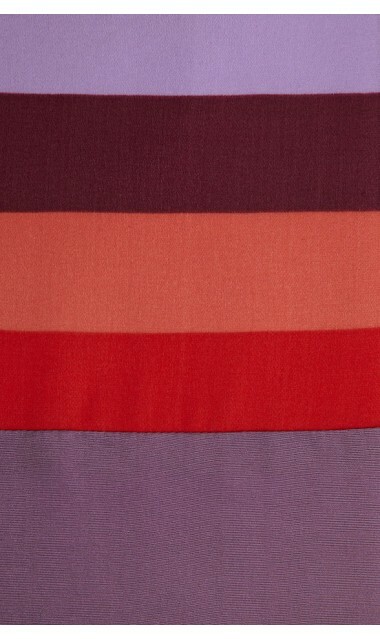 Zahara Bib, $248. 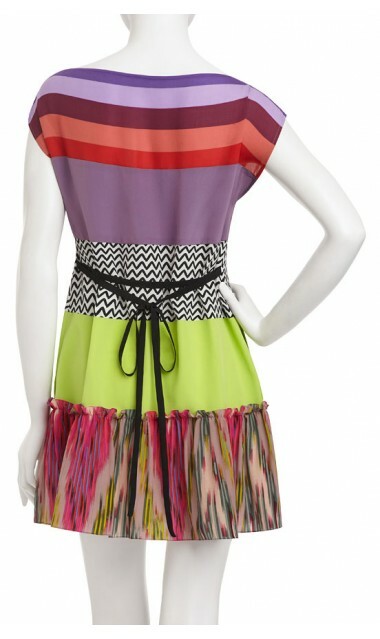 Color blocking Trend. 3. Bamboleo, $228. 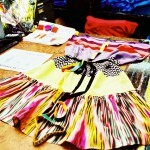 Mixed Tropical Colors. 1. Starry Night, $98. Available in Gold. 2. Ever After, $49. Available in Silver or Gold. 3. On the Mark, $49. Available in Gold. 4. After Midnight, $89. Available in Gold. 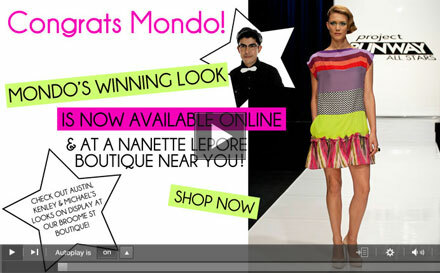 Project Runway All-Stars: Congrats Mondo! Last night, Project Runway All-Stars unveiled the winner of ‘The Mystery Dress Challenge’ where the all-stars had to design a ready-to-wear look within budget for Nanette Lepore. 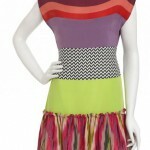 Designed by Mondo Guerra, the winning dress features a bateau neckline, tie at back waist, slant pockets at sides, a ruffled hem and is made of 100% silk. We feel that the mix of colors and prints were well executed and love how Nanette ‘finessed’ the silhouette to fit her clientele. 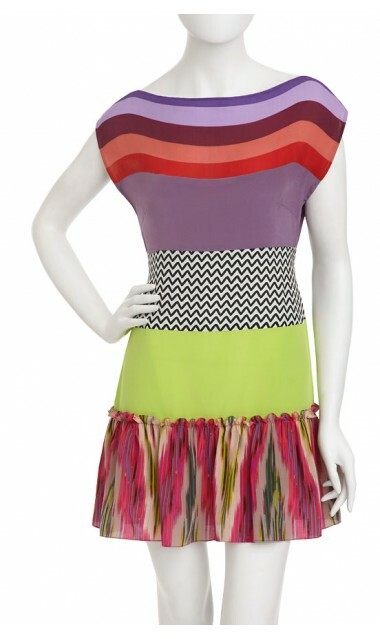 It is currently retailed at $298 with 100% of the profits going to the Save the Garment Center Organization and you can get the dress at Nanette Lepore Boutiques (and online where it is already SOLD OUT but available for back order with an expected ship date of May 15th, 2012). Elizabeth Suda, designer and founder of Article 22, a Brooklyn based sustainable design company that creates goods that tell stories and solve problems, is on a mission to create economic opportunity for traditional artisans that lack market knowledge and access. 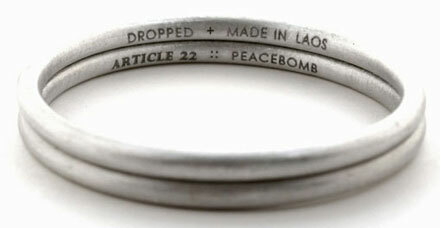 One of her projects is Peacebomb, a jewelry collection made by Laotian artisans from Vietnam War era bombs dropped on Laos, the most heavily bombed country in history. 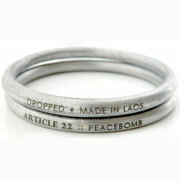 Peacebomb is about turning negative to positive: artisans reshape the bombs and we buy them back. Taking a market oriented and design driven approach to sustainable economic development through handcrafts, she partners with NGOs and traditional artisan communities to capacity build upon pre-existing skills sets and develop small businesses in a way that is natural to local lifestyle, environment, and culture. 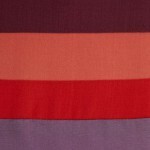 She co-creates authentic, beautiful and meaningful products for a discerning international market. Then, she tells their story. 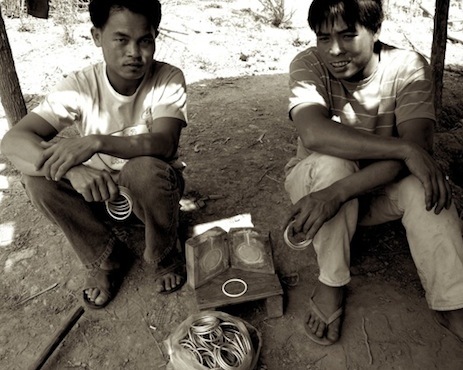 Lao metal smiths who engineered bracelet molds for the Peace Bomb bracelet. Photo: Article 22.